* Note that the directly on the beach column means that the condo building is on the beach, east of A1A. The condo unit for sale may not face the beach directly. The inventory of condos for sale has stayed steady over the past several months. There were 70 Ormond By The Sea condos for sale in November 2018. The inventory has steadily increasing since the beginning of 2018, when there were 54 condos for sale. Call Realtor® Rhonda Lehnen of Ocean View Realty Group for information about Ormond Beach and Ormond By The Sea, Florida homes and condos for sale and for rent 386-441-8245 or visit the Ocean View Realty Group website where you can search the Daytona Beach Area Multiple Listing Service (MLS) anonymously. Realtor® Rhonda Lehnen can also give you a free market analysis for your Ormond By The Sea, Florida home or condo and help you get your property ready to sell. Email Rhonda at ovforsale@aol.com. Through the Daytona Beach Area Association of Realtors® Multiple Listing Service (MLS) there were 25 Ormond By The Sea, Florida homes sold in March 2019, and three of the sales were a short sale or foreclosure. Additionally, there are 40 homes under contract waiting closing and one of those have lender involvement. 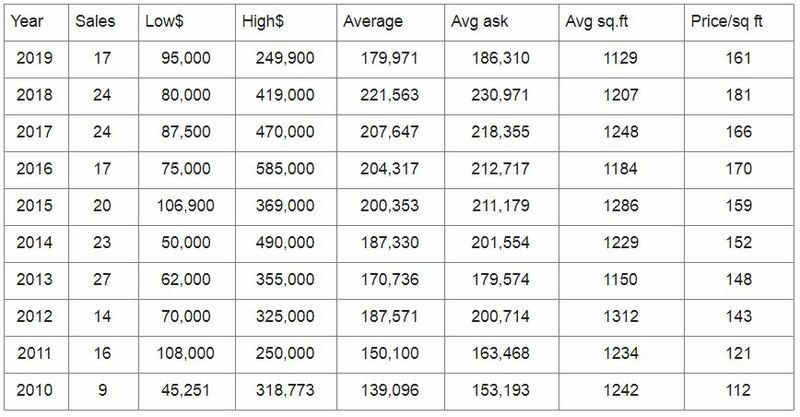 The highest priced home sold was a 3 bedroom on Bonnie View Drive for $465,000 and the lowest priced was a 3 bedroom on Brooks Drive for $111,300. Ormond By The Sea, Florida Homes Sold last month by price range. This graph shows Ormond By The Sea, Florida homes sold comparing previous years for this month. For information about Ormond Beach and Ormond By The Sea, Florida homes and condos for sale and for rent call Realtor® Rhonda Lehnen, 386-441-8245 or visit the Ocean View Realty Group website at www.ovrealty.com where you can also search the Daytona Beach Area Multiple Listing Service (MLS) anonymously. - Seaside Tavern is now open at 1350 Ocean Shore blvd. - Flapjack Johnny’s is now open at 330 S Atlantic, the old Burger King building, serving breakfast and lunch. - Argosy Park is open at 1255 Ocean Shore Blvd. with 42 off beach parking spaces where Argosy Motel once was. - Sunwing Airlines has seasonal flights Toronto to/from Daytona Beach airport. - The Florida Hospital Oceanside building on A1A has been demolished. - Miami Grill and bar is now open at One Daytona. - Dave and Busters is now open at Tomoka Town Square. - The Publix in the Trails Shopping Center on Nova Rd. will close by the end of the year and will be rebuilt and expanded to include the former CVS building next to it. They expect to reopen in about a year. 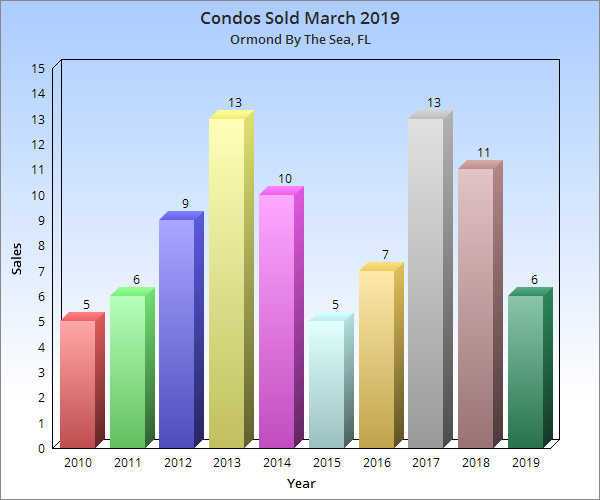 This table shows the condos sold January 1 through March 31 in Ormond By The Sea, Florida in 2019 through the Daytona Beach Area Realtors@ Multiple Listing Service (MLS) with a comparison to prior years. Condos that are priced right for the market will sell quickly while anything overpriced will sit on the market. Contact Ocean View Realty Group to help you buy, sell or rent your Ormond By The Sea home or condo. Visit our website www.ovrealty.com and our vacation rental website at www.ormondbeachcondorentals.com or call us at 386-441-8245. Email for rental information at ovrentals@aol.com. Rhonda Lehnen is our Realtor® and can help with buying or selling, ovforsale@aol.com. Real estate market information is updated on the Ocean View Realty Group market watch page. Go there for several statistics on homes and condos for sale and sold in Ormond By The Sea, Florida. ​The list of the Ormond By The Sea, Florida Condo Sales for this month. showing 2019 compared to previous years for this month. For information about Ormond Beach and Ormond By The Sea, Florida homes and condos for sale and for rent, call 386-441-8245 or visit the Ocean View Realty Group website at www.ovrealty.com where you can also search the Daytona Beach Area Multiple Listing Service (MLS) anonymously.If you are thinking of selling contact Realtor® Rhonda Lehnen of Ocean View Realty Group at 386-441-8245 today for additional information and to get a free market analysis for your Ormond By The Sea condo or home. Email Rhonda at ovforsale@aol.com. 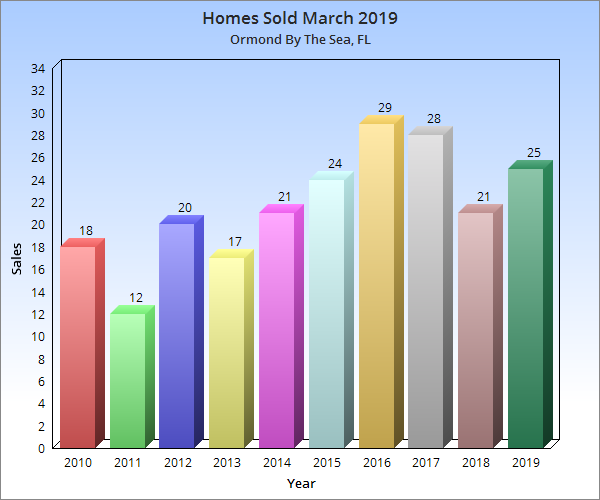 There are 105 homes for sale in Ormond By The Sea, Florida through the Daytona Beach Area Association of Realtors® Multiple Listing Service (MLS) as of March 31, 2019, 4 less than at the end of last month. An additional 46 homes are under contract awaiting closing, 3 of which involves a lender, either as a short sale or foreclosure. Asking prices for Ormond By The Sea homes currently for sale range from $169,900 to $2,900,000. The inventory of Ormond By The Sea Homes For Sale has stayed steady over the past several months. There are investors waiting for the lower priced homes to come available and if homes come on the market at a reasonable price they are being sold quickly. At the beginning of November 2018, there were 107 Ormond By The Sea, Florida homes for sale so the inventory has remained steady so far throughout 2019. To view homes and condos available through Ocean View Realty Group or to search the Daytona Beach, Florida Area Multiple Listing Service (MLS) for homes and condos for sale in Ormond Beach and Ormond By The Sea, Florida go to the sales page of the Ocean View Realty Group website. For information about Ormond Beach and Ormond By The Sea, Florida homes and condos for sale and for rent call 386-441-8245 or visit the Ocean View Realty Group website at www.ovrealty.com. If you are considering adding your property to our vacation rental program or long term rental program, do not hesitate to contact Ocean View Realty Group at 386-441-8245. Villa Sereno Condominium is an Ormond By The Sea Townhouse Style Condominium built in 1973 and contains 38 units. Most units face the pool area and have an ocean view. Villa Sereno consists of two rows of townhouse condos going east to west. There is a courtyard and pool between the 2 rows of condos. One separate row of 6 condo units faces the ocean and is to the south of the other buildings that surround the courtyard and pool. If you are thinking of buying or relocating to Ormond By The Sea, Florida, you may to consider the adorable Villa Sereno Condo. Contact Realtor® Rhonda Lehnen at Ocean View Realty Group to get professional assistance in finding the right Ormond By The Sea Condo for you. You may also visit the Ocean View Realty Group web site sales page where you can also search the entire Daytona Beach Area Multiple Listing Service (MLS) anonymously. Ocean View Realty Group has an information sheet with some basic information about the Villa Sereno Condo in Ormond By The Sea, Florida. View the information sheet for Villa Sereno as well as additional photos of the Villa Sereno and also interior photos of some of the vacation rental units that Ocean View Realty Group has available here. Ocean View Vacation Rentals has 2 vacation condos located in the Villa Sereno Condo. Check them out right here! No smoking and no pets allowed. Reserve your next beach side vacation in beautiful Ormond By The Sea, Florida by calling us at 386-441-8245. As of March 31, 2019, we have 79 Ormond By The Sea, Florida condos for sale through the Daytona Beach Area Realtors® Multiple Listing Service (MLS), which is 1 less than the end of last month. There are 32 priced under $200,000 and none of those are under $100,000. Additionally, there are 16 condos under contract pending closing, one of which involves a lender, either as a short sale or foreclosure. door to bring in groceries without having to deal with the elevator. The Seabridge North complex has a freshwater swimming pool at the south end of the buildings and laundry facilities in each unit. There is enough parking for 2 vehicles for every unit so the lot is really never full. Each unit has one reserved space under the carports. Some units have garages, which are also an additional cost on the owners’ maintenance fee. Most of the units are 2 Bedroom, 2 Bath and are approximately 936 Sq ft. The end units and one in the middle of the north building are larger, at approximately 1110 Sq Ft. The middle units in the south building are 3 bedrooms. -Trucks and trailers are not allowed on the property. -Owners are allowed to have small pets. -There are no rental restrictions although units are usually rented on a weekly minimum basis. Seabridge North Condo in Ormond By The Sea has become a favorite Ormond Beach condo for many who return each year to enjoy all that Ormond By The Sea and Central Florida have to offer. Whether you are looking for a terrific place to live, a winter getaway for several months, or a week or two as a summer vacation rental, you will enjoy the sun, the sand, the surf, the pool and the peace and quiet of Ormond By The Sea. Of course, if Seabridge North Condo in Ormond By The Sea is your home, you get all of this every day. If you are thinking of buying or relocating to Ormond By The Sea, Florida, you should consider the well maintained Seabridge North Condo. Contact Realtor® Rhonda Lehnen at Ocean View Realty Group to get professional assistance in finding the right Ormond By The Sea Condo for you. You may also visit the Ocean View Realty Group web site sales page where you can also search the entire Daytona Beach Area Multiple Listing Service (MLS) anonymously. Ocean View Realty Group has an information sheet with some basic information about the Seabridge North Condo in Ormond By The Sea Florida. View the information sheet for Seabridge North Condominium as well as additional photos of the Seabridge North Condo and also interior photos of some of the vacation rental units that Ocean View Realty Group has available. Visit the Ocean View Realty Group vacation rental web site. This page also has information about the sister condo to Seabridge North Condo, Seabridge South Condo. 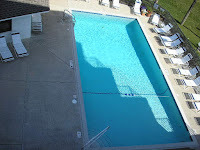 Ocean View Vacation Rentals has 7 vacation condos located in the Seabridge North Condo. Check them out right here! No smoking and no pets allowed. Reserve your next beach side vacation in beautiful Ormond By The Sea, Florida by calling us at 386-441-8245. Presented to you by Ocean View Realty Market Watch. As of February 28, 2019, we have 80 Ormond By The Sea, Florida condos for sale through the Daytona Beach Area Realtors® Multiple Listing Service (MLS), which is 9 more than the end of last month. There are 32 priced under $200,000 and none of those are under $100,000. Additionally, there are 6 condos under contract pending closing, one of which involves a lender, either as a short sale or foreclosure. The inventory of condos for sale has stayed steady over the past several months. There were 70 Ormond By The Sea condos for sale in November 2018. The inventory has increased greatly since the beginning of 2018, when there were 54 condos for sale. * Note that the directly on the beach column means that the condo building is on the beach, east of A1A. The condo unit for sale may not face the beach directly. Call Realtor® Rhonda Lehnen of Ocean View Realty Group for information about Ormond Beach & Ormond By The Sea homes and condos for sale and for rent 386-441-8245 or visit the Ocean View Realty Group website where you can search the Daytona Beach Area Multiple Listing Service (MLS) anonymously. Realtor® Rhonda Lehnen can also give you a free market analysis for your Ormond By The Sea home or condo and help you get your property ready to sell. Email Rhonda at ovforsale@aol.com. 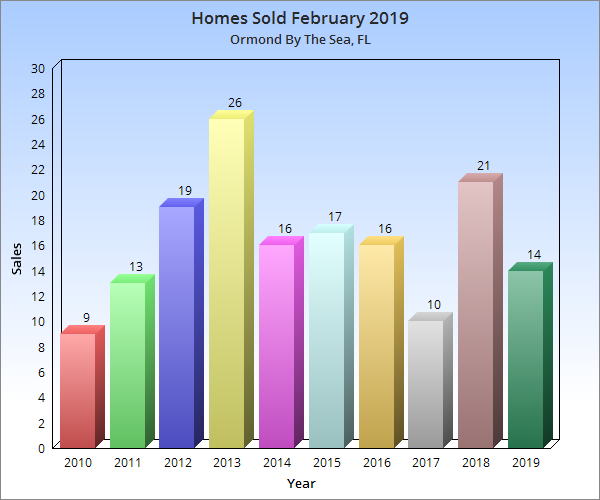 Through the Daytona Beach Area Association of Realtors® Multiple Listing Service (MLS) there were 14 Ormond By The Sea, Florida homes sold in February 2019, and none of the sales were a short sale or foreclosure. Additionally, there are 17 homes under contract awaiting closing and none of those have lender involvement. The highest priced home sold was a 3 bedroom on St. John's Place for $380,000 and the lowest priced was a 2 bedroom on Seaside Drive for $145,500. Ormond By The Sea, Florida ~ Homes Sold last month by price range. This graph shows Ormond By The Sea, FL homes sold comparing previous years for this month. For information about Ormond Beach and Ormond By The Sea, Florida homes and condos for sale and for rent call Realtor® Rhonda Lehnen 386-441-8245 or visit the Ocean View Realty Group website at www.ovrealty.com where you can also search the Daytona Beach Area Multiple Listing Service (MLS) anonymously. Realtor® Rhonda Lehnen of Ocean View Realty Group can also prepare a free market analysis for you if you are thinking of selling your Ormond By The Sea home or condo and help you get your property ready to sell. Email Realtor® Rhonda at ovforsale@aol.com.